I'm a big fan of Uncharted and the art so this book is pretty much a must-buy for me. When it comes to video game art and concept, I feel that Uncharted probably has the most absorbing characters and environments. The main characters are quite likeable and memorable. The environments in the game are absolutely breathtaking. 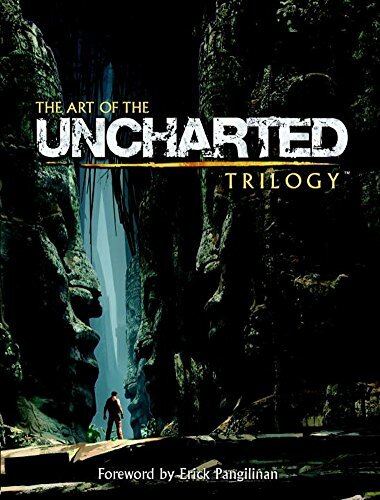 The Art of the Uncharted Trilogy features the character and environment design for the first three games. It's a 192-page hardcover filled with wonderful art. Looking back at all the beautiful artworks reminds me of the time I first played the game. I was awed by the visuals, and I still am. Interestingly, art from the first game had a more comic-like look and feel to them, e.g. line art for character designs. From the second game onwards, it went on to have more realism built in. You can see that in the progression of design for the main characters from the first to third game. Environment art also started to be more detailed. The downside of the book is there should have been more art included. 192 pages are divided among the three games so actually each game just has under a hundred pages. A lot of artworks were left out for sure because The Art of Uncharted 2: Among Thieves by itself is already 272 pages. It's difficult to imagine how much artworks were left out for the first and third game, and how much more awesome this book could have been. And because there's the dedicated artbook for the Uncharted 2, artworks for that game are duplicated in majority inside this book. As a standalone book, it's definitely highly recommended to all the Uncharted fans and those who like video game art. I just wished I could see more.